How to create products from polymer clay with their hands? How to bake the clay? Home / Needlework / What can be made of polymer clay? What can be made of polymer clay? Products made of clay are high in our timepopularity. 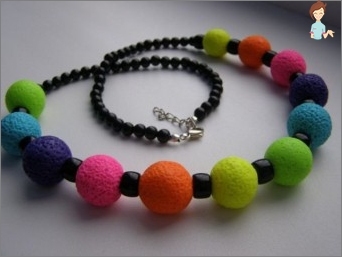 This is due to the fact that it is very malleable, can mimic other types of materials and from it you can do almost anything: jewelry, dolls, flowers, Christmas decorations. The process itself is fascinating and charming, but the result can not but rejoice, because you end up with a unique creation that can not be repeated. Create ornaments from polymer clay a verysimply, it is the same that the molding of the clay, but the beauty of clay that it hardens under the influence of high temperatures and becomes very hard. Buy the material for molding can beInternet stores or at specialty stores that sell products for hand made. The most common manufacturers of polymer clay are: Fimo, Cernit, Pardo, Thai Clay. To begin to work better with a soft material, for example with «Sculpey» or «Fimo Soft». Before proceeding to the manufacture of jewelry from polymer clay with your hands, you need to prepare the workplace and stock tools for the job. The tile may be used or a flat glass board as a work surface. Of the tools needed: stationery sharp knife, brushes of different thicknesses, the machine for rolling clay rolling pin or glass or ceramic, a special lacquer for plastics, toothpicks, wet wipes and a variety of accessories, depending on what you plan to do. To on clay had no fingerprints, must be handled with gloves, better use of health because they fit well in the hand and create the effect of "second skin". Before you start modeling clay should be thoroughly knead,knead be small pieces, gradually adding new ones. The result is a homogeneous soft mass, from which will be very easy to mold products. Tools used for the molding of plastics should not be used for other work. Many needlewoman created from it realmasterpieces of their own hands. They molded the flowers that the photos can not be distinguished from the real thing, made a variety of jewelry, dolls, animal figurines, decorated frames, vases, glasses and do many other things. This plastic material can do everything, more importantly, to the imagination, and you are ready to work. 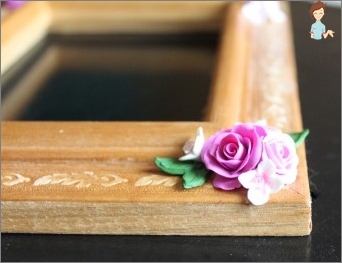 For example, a beginner can easily decoratepolymer clay photo frame. It takes just an ordinary picture frame, the material itself and tools. Better use samozastyvayuschuyu clay, which does not need to be baked. You can take silicone molds bydetails of which are to decorate the frame. The molds need to put the clay, so that it does not extend beyond the edge, wait until it hardens, carefully remove the finished parts that they are not cracked or broken. Then paint the product, and glue PVA glue ready to decorate the frame. Photo frame with his hands ready! At first, it works better in practiceproduction of simple products that do not require knowledge of special techniques of molding plastics. By New Year's holidays, you can sculpt a lot of amazing and beautiful Christmas decorations from polymer clay. You can, for example, blind snowflake, Santa Claus, Snow White, Ball. If you twist the two harness made of clay in different colors,get Christmas candy, which also can be hung on the Christmas tree. If you want to make Christmas figures with a pattern on the surface, you can use the materials at hand: buttons with a pattern, shells, fabrics, etc. All work can be carried out together with their children and other family members, it will bring to your daily routine a lot of bright and fresh colors! How to bake polymer clay? When the ornament is ready, it needs to be baked inoven unless samozastyvayuschaya clay used. Before baking, do the necessary holes in the product. 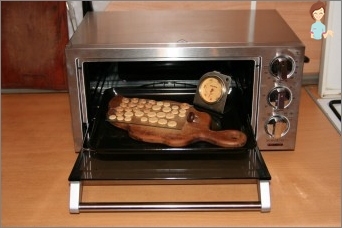 Use only gas or electric oven, a microwave oven is not suitable for baking clay. Do not use the same oven forcooking and baking clay, because when it is baked, the plasticizer is released therefrom, it settles on the walls of the oven chamber and could fall on food. It is important to use the oven with a thermometer, becausethat you need to bake the clay at a specific temperature on the package. Stack products recommended on the glass or white cardboard to during baking items are not distorted, it is recommended to place them in the oven on a toothpick, which is attached to the cardboard. When the time comes, and the product is ready,the oven must be switched off and opened the door. Just not worth it to get the figures that from the sharp changes in temperature they were not cracks. After using the oven should be thoroughly washed. When the product has cooled down, it is necessary to varnish and leave to dry. Thereafter, the composition can form a paste or parts to the substrate. In the manufacture of jewelry, figurines, flowers, Christmas ornaments made of polymer clay, you can use other materials to add, for example, feathers, fabric, beads, natural materials. Use your imagination and create with pleasure!